Guardians of the Galaxy by Abnett & Lanning Reading Order! Guardians of the Galaxy Vol. 2 is perhaps the most hotly anticipated Marvel movie of the decade, with the highest franchise approval rating of any of Marvel’s immensely popular properties. To celebrate, I’ll be taking a look at every era of Guardians of the Galaxy comics, highlighting the great moments, and which series will appeal to different types of fans. When all is said and done, I’ll also be ranking the greatest Guardians of the Galaxy comics of all time! For those who just want to get started reading as many Guardians comics as possible, I recommend the below Comic Book Herald reading guides! 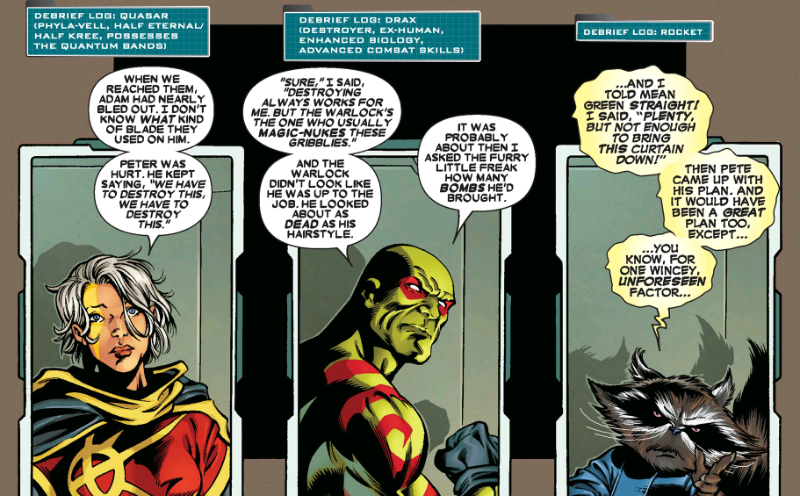 Dan Abnett, Andy Lanning, and (initially) Paul Pelletier Guardians of the Galaxy! Generally speaking, this is pretty great advice. In 2008, following Marvel’s Annihilation: Conquest event and a Keith Giffen written four issue miniseries called Annihilation Conquest: Star-Lord , an all-new Guardians of the Galaxy #1 launched. The first issue, written by Dan Abnett and Andy Lanning and drawn by Paul Pelletier marks the first Guardians of the Galaxy series since Jim Valentino’s series launch in 1990. From the first issue it was clear that Abnett and Lanning’s Guardians, which would ultimately run twenty-five issues (plus The Thanos Imperative event ), had a stylistic and tonal edge that was unmatched. 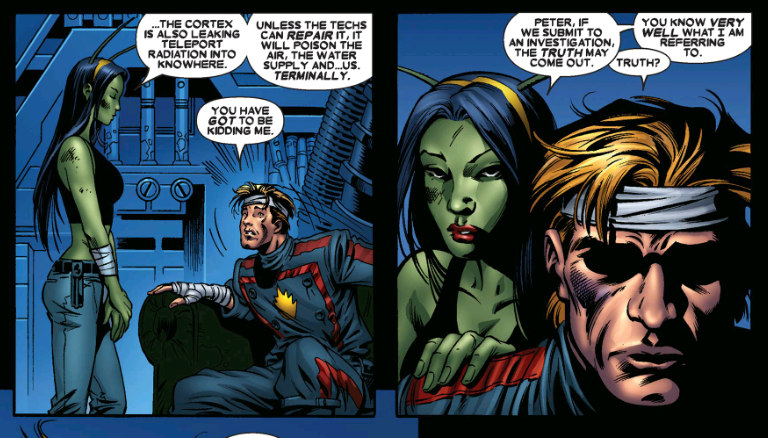 Each issue featured action interspersed with retroactive mission debrief logs, blending post-mission regrets and current mission tension in the confusing temporal swatch that comes with Mantis involved. More importantly, Abnett and Lanning completely revamped the Guardians of the Galaxy line-up, eschewing the Guardians of 3000 A.D. for a core of Star-Lord, Gamora, Drax the Destroyer, Rocket Raccoon, Groot, Adam Warlock, Mantis, and Quasar (Phyla-Vell). The new lineup allowed the book to carry through on the established character development of the immensely successful Annihilation. and built-in a humor and dysfunction that was never present with the militia space resistance of Guardians 3000 A.D.
That said, re-reading this run on Guardians I was surprised how quickly Abnett & Lanning dive deep into classic Marvel Cosmic references and the original Guardians lineup. Knowledge of Marvel cosmic history really pays off here, with Adam Warlock as more of a main lead than Star-Lord for much of the series. Likewise Jim Starlin’s 1970’s indictment of religion, the Universal Church of Truth, is featured prominently throughout, with frequent references to their past with Warlock. Most surprisingly to me, classic Guardians history is referenced almost immediately, with an amnesiac Major Victory appearing as early as issue #2, and Starhawk becoming a mysterious villain by issue #3. Marvel Cinematic Universe fans may also be surprised to find that Peter Quill is more of a Nick Fury or Maxwell Lord style leader with dark secrets and extremely flexible ethics. The Chris Pratt Star-Lord is a fun-loving quasi-criminal, but 2008 Guardians Quill is a war-worn veteran, carrying heavy guilt for his role in allowing the Annihilation Conquest to get as far as it did. Even through this complexity, Star-Lord is cracking jokes (leading to Gamora’s scathingly angry “You’re not nearly as funny as you think you are”) but he’s far from the light-hearted leader of 2014’s surprise smash movie. Through its 25 issues, Guardians is consistently caught up in event tie-ins, yet rarely lags because of it. Guardians launches into Secret Invasion tie-ins almost immediately, with issues #4 to #6, yet the series actually benefits with logical cosmic connections to the Earth-bound event. Likewise, Guardians becomes so integral to the Marvel Cosmic landscape that it’s a core player in both War of Kings and Realm of Kings, before finally concluding the era with Thanos Imperative . In short, this is the Guardians of the Galaxy pick for comic book fans, and for good reason. Who Are These Guardians For? Anyone who likes Marvel comics, especially modern Marvel Cosmic. Do Guardians Movie Fans Need This Comic Run? Absolutely. The Guardians runs to come are more connected tonally to the movie, but this is the prototype that would inspire the style, humor, and lineup of the MCU’s Guardians of the Galaxy. Where Can I Find These Comics? 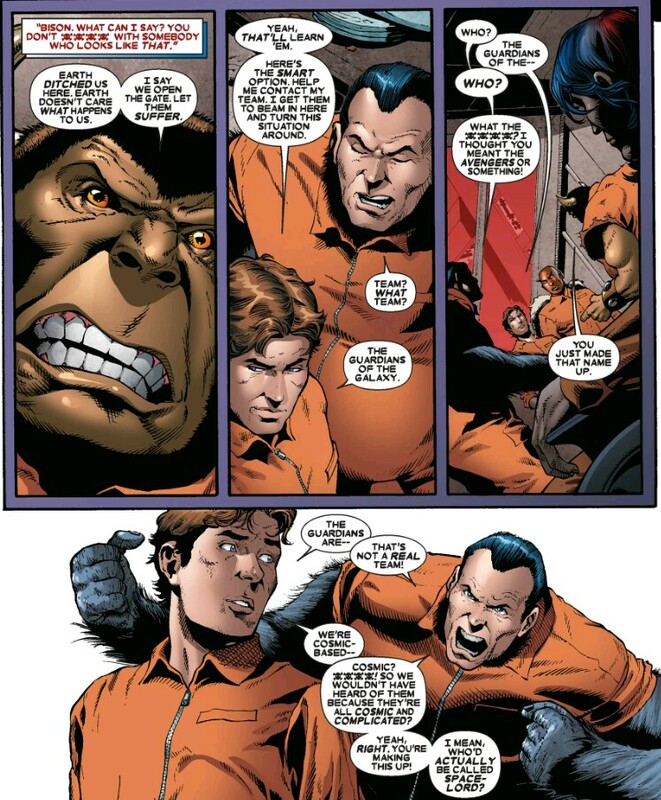 Gorilla Man and Bison savaging the Guardians of the Galaxy and Star-Lord names. And again, this is coming from Gorilla Man (human head, gorilla body) and Bison (Bison head… also bison body?). The excellence of Abnett & Lanning’s Guardians of the Galaxy solidified the 2000’s era of Marvel Cosmic as one of the absolute highpoints of Marvel Comics in the millennium. Likewise, there’s simply no chance in Knowhere that Marvel Studios greenlights Guardians of the Galaxy as their MCU intro to Marvel Cosmic without this comic. We’ll be seeing its influence on screen for years to come. The Marvel NOW! Guardians of the Galaxy by Brian Michael Bendis. I love the part in one of the first few issues where Vance and rocket discuss the name. It’s the best “naming of a group” scene in comics. Definetely the best guardians run.